Hanold Auctioneering is a family owned business based in Brighton, Illinois. The company started in June of 2008 after Cody Hanold attended the WORLD Wide College of Auctioneering in Mason City, Iowa. Now in their sixth year, they find their business growing more every month with the moto of "no job too big or too small". Cody, a first generation auctioneer, found his love for the auction industry as a child while traveling to a variety of different auctions with his father. A member of both the Illinois and National Auctioneers Associations, he stays busy through the week by selling livestock at the Schuyler Livestock barn located in Rushville, IL and in Salem, IL at United Producers. You can find Cody at other livestock barns within the area anytime their regular auctioneer is unavailable. 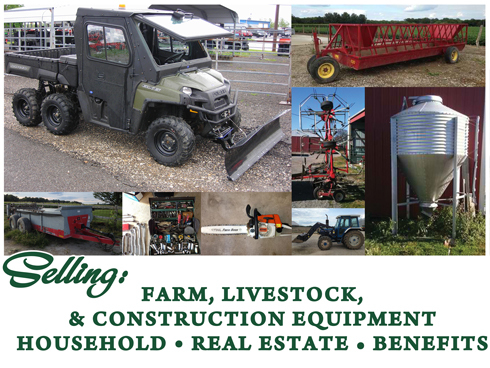 Hanold Auctioneering sells everything ranging from livestock, to Real Estate and household items including furniture and tools, complete liquidations, going out-of-business sales, benefits, and much, much, more. If it can be sold, we can sell it, even if its bolted to the floor. Give us a call, and put Hanold Auctioneering to work for you!